Calzolaio Pasta Company is a popular Italian and Seafood restaurant located in the historic former Bass shoe factory overlooking Wilson Stream in Wilton, Maine, a small town of about 4,200 people. As a testament to its popularity, Calzolaio serves up to 4,000 meals in a month, almost as many as the entire population of Wilton. During the warmer months, Calzolaio patrons can enjoy the outside patio with a lovely view of the lake and waterfall. Inside, the decor is elegantly rustic with string lights and beautiful Italian touches, and offers a private banquet room frequently used for local events. Calzolaio cuisine, however, is anything but small town. It boasts brick oven style pizza dough choices in basic, organic multi grain or gluten-free, with gluten-free preparation available for 98 percent of its menu; homemade sauces and pasta including exceptional Italian dishes such as Tortellini Carbonnara; and celebrates Maine seafood with Maine lobster served fresh, as scampi or in a roll, and natural meats from Pineland Farms where livestock is raised humanely and naturally in a clean, stress free environment without the use of antibiotics, added growth hormones or animal by-products in the feed. Tom and Rocell Marcellino are the owners of Calzolaio. They have been in the restaurant business their whole lives and offering this level of quality fare is important to them, personally, and they understand how much it is appreciated by their patrons. Over the years, Tom has extensively researched the latest technologies available for improving restaurant operations efficiency so they can offer the best dining experience to their patrons while improving the bottom line. One of the best restaurant technologies Tom has seen in recent years is using a remote tablet to enter orders and process payments right at tableside, eliminating servers wasting time running back and forth to wait stations, the kitchen or payment terminals. Unfortunately, even the latest software upgrade of their old point-of-sale (POS) system wasn’t able to handle remote ordering on a tablet. Nevertheless, they decided to go forward with the transition. Tom researched available POS systems with the capability of remote ordering tableside on a tablet, knowing they didn’t want a fully cloud-based system. “Cloud-based systems are not user friendly in a fast paced environment – every time an entry is made in the system or an order is placed, it has to go to the cloud and back. We have fiber optic tech here so our data speeds are very fast. Even with that, fully cloud-based systems are laggy,” Tom said. Tom said the TouchBistro mobile POS installation was so easy he was able to do most of it himself, with the biggest part inputting the menu. Without having to pay any additional programming fees, they easily set up customized reports that matched the restaurant’s day-today operations and the way they manage the business. Using the item count down report he customized from a template, Tom was able to isolate where beer sales were literally leaking out. “From the cover count report, where I can put any item on count down, I found out we were getting only 90 pints of beer per keg when we should have gotten 120. While I saw the bartenders charging everyone, I watched the beer literally going down the drain because it was too foamy. I checked the temperature on the beer and found it was eight degrees higher than it should have been. After I changed the setting and cleaned the lines, we got back up to 120 beers for every keg,” Tom said. 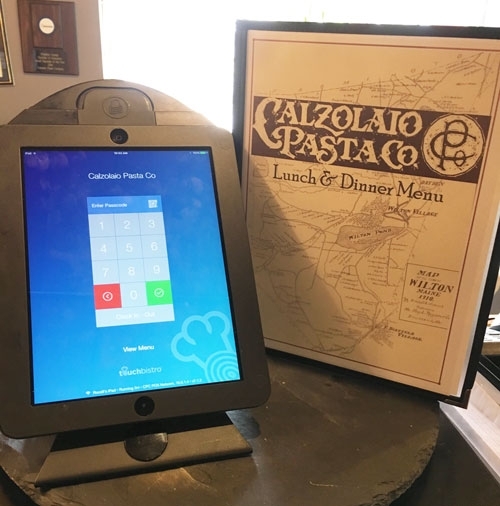 Although installed only a few months ago in January, Calzolaio is already seeing an increase of 12 to 14 percent in profit that Tom attributes the improved efficiency made possible by the TouchBistro iPad POS. Calzolaio also utilizes one of the several payment processors that are integrated with TouchBistro for fast tableside bill payment processing. This eliminated additional multiple trips for the wait staff, while improving security for the customers as their credit cards never had to leave their tables, and created an overall better customer experience. “Servers leave the iPad Mini at the table so customers can sign on the screen, add the tip and choose to email a receipt to themselves if they want. We don’t worry about the customer going in and messing around with the iPad Mini because TouchBistro security is good and allows you to set up QR codes for managers and servers,” Tom said. Tom said they also use the Archelon wall mount enclosure in the kitchen to free up valuable counter space, and the built in swivel and tilt makes it very convenient for anyone to use. Archelons Enclosures was their first choice because of the rugged and sleek design. POS Technology At The Nat Restaurant Show Part 2 – EMV at the table? Shopping for POS? Download a POS Buyers Guide here. And find some coupons for point of sale equipment here.